The puzzle has its merits—mainly some lively fill and decent theme answers. But there are a couple of inexplicable problems here, both intrinsic and extrinsic. Let's start with the small, easy-to-fill corners in the NE and SW. There's just no excuse to go with a French word like PLAGE there, esp. as Nothing Good Is Being Held in Place there. You go w/ PLAGE and you *still* make us suffer through GLO and ESS? I don't get that. But worse, much much worse, is BHT. I've never heard of it, but I've never heard of many things, so that's not the main problem. The main problem is that a. it is comparatively obscure (NYT hasn't used it in Over Ten Years, and then it was on a Thursday, and, presumably, *necessary* to make some important thematic thing happen); and b. it is an initialism where there absolutely, positively doesn't need to be one. 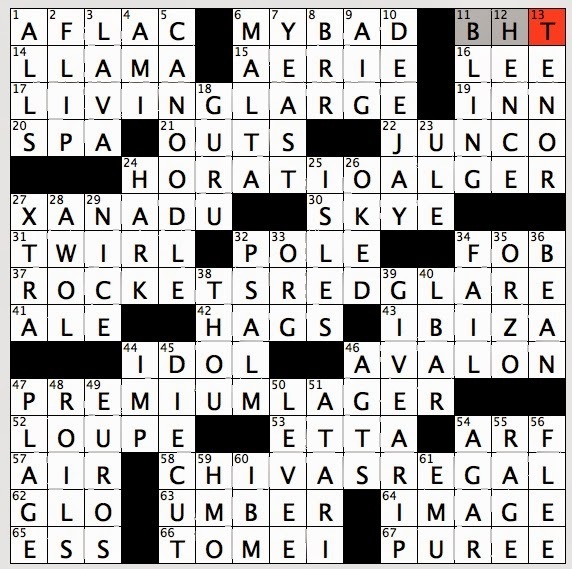 I'm dumbfounded that the constructor, the editor, someone wouldn't take ten seconds to rid the puzzle of BHT. It's not holding Anything in place. You can tear that corner out and refill it a jillion different ways. BHT? I can't even … I don't know. Your ear has to be so tin to think that's a good idea. Mind-blowing. Due diligence. It's important in the electronic age (in any age, I guess, but especially now—you simply can't construct puzzles as if this database information does not exist; not anymore). Pont-l'Évêque is a French cheese, originally manufactured in the area around the commune of Pont-l'Évêque, between Deauville and Lisieux in the Calvados département of Basse-Normandie. It is probably the oldest Norman cheese still in production. This was messed up on a couple of fronts. First, it's simply not a Monday, difficulty-wise. Over my average Tuesday time, and I'm clearly not alone judging from times posted at the NYT site. Not a *hard* puzzle, in absolute terms, by any means, but way off the Monday average. PONT L'ÉVÊQUE I've never even heard of. Looking at pictures, I think I've eaten it, but yeesh. Not a Monday answer in this country. PONTIFICATE fits, and probably would've worked better on a Monday. But I wouldn't be complaining about this answer on a Tuesday. It's a fine answer—it's just one of the reasons this played tough for Monday. Another: a low word count (for a Monday, 74 words qualifies as low). All corners are pretty wide open, making footholds harder to find. Again, doable. This puzzle is simply (and obviously) misplaced on Monday. Bigger problem, for me, was PANT-SUITED, which is a horrific and unnecessary answer. It's an adjective that you would simply rarely, if ever, use. Other PANT- words exist. PANTHEISTS. 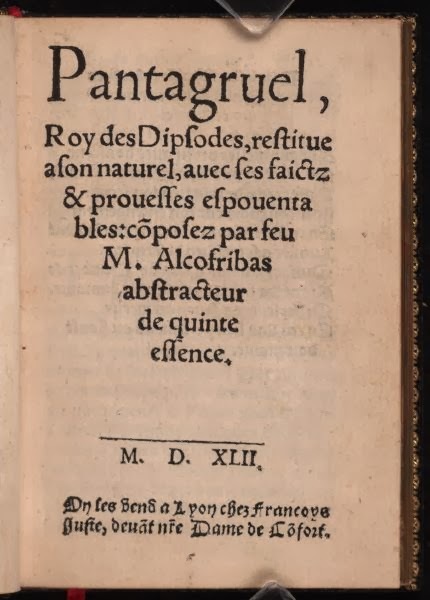 PANTAGRUEL. I mean, I haven't really tried, but there have to be more and better answers than PANT-SUITED, which is only here because that answer needs to be as long as PUNT RETURN, and PANT SUITS is one letter short. There really aren't better PUNT- answers, I don't think. PUNT BLOCK is OK, but far less common. So thumbs-down to that themer, and thumbs-down also to PINT MEASURE, which appears to be … a pint? I guess we're talking about the container, so OK, I'm sure it's a thing, but of all the PINT- answers … yuck. There's also something so desperately awkward about the clue. [Half-quart container] … oh, you mean a pint container? 'Cause that's what we call "Half-quarts." No one says SOAPER (42D: Daytime drama, informally). Please change "informally" to "in erstwhile times," and then Kill this answer, please. RUBATO (48D: Fluctuation of musical tempo), very tough for Monday. Fine word, not really in my vocabulary. Again, more late-week than it is Monday. WEB APP, again, not Monday (1D: Google Calendar, e.g., informally). I had WIDGET at first. Don't mind the answer. Just baffled, again, by the placement. NANANA is manifestly terrible, but I can let an answer or two like that slide. Really like OUT THERE, but that was also hard to see. Anyway, this was a hit/miss Tuesday puzzle. The Amana Colonies are seven villages on 26,000 acres (11,000 ha) in east-central Iowa, United States:Amana (or Main Amana), East Amana, High Amana, Middle Amana, South Amana, West Amana, andHomestead. The villages were built and settled by German Pietists, who were persecuted in their homeland by the German state government and the Lutheran Church. Calling themselves the Community of True Inspiration (German: die Gemeinde der wahren Inspiration), they first settled in New York near Buffalo in what is now the Town of West Seneca. However, seeking more isolated surroundings, they moved to Iowa (near present-day Iowa City) in 1856. They lived a communal life until the mid-1930s. For eighty years, the Amana Colonies maintained an almost completely self-sufficient local economy, importing very little from the industrializing American economy. The Amanians were able to achieve this independence and lifestyle by adhering to the specialized crafting and farming occupations that they had brought with them from Europe. Craftsmen passed their skills and techniques on from one generation to the next. They used hand, horse, wind, and water power, and made their own furniture, clothes, and other goods. The community voted to form a for-profit organization during the Great Depression, the Amana Society, which included the Amana Corporation. Nearly eight years ago now, so maybe it doesn't matter. Still, I'm surprised Joel didn't do a little research before embarking on this one. On the other hand, who cares? Will took it, and a sale's a sale. At any rate, judging this thing on its own merits, it's fantastic. When a theme is so nicely executed, and when fill is, in the main, rock solid, I don't really have the inclination to point out the handfuls of short bad stuff, 'cause that stuff is doing what it's supposed to do—staying small and largely unnoticed, and holding together something lovely. I don't particularly like U TUBE as fill, but the clue more than redeems it (7D: Lab item that sounds like a popular website). I balked at 17A: Model/actress Keibler because who? and because I figured someone so random probably had one of them there I-ending names (i.e. STACI), and SYSCO … I don't really know that company. Could've been SISCO for all I knew. But the more common STACY won the day. Wish I had more trouble spots to talk about, but, as I say, this thing was easy. *I'm not serious, but that won't keep me from getting mail. "Ringo" was a hit single for the Canadian-born actor, Lorne Greene, in 1964. The song's actual sung lyrics are limited to the title word alone, performed by an unidentified male chorus. 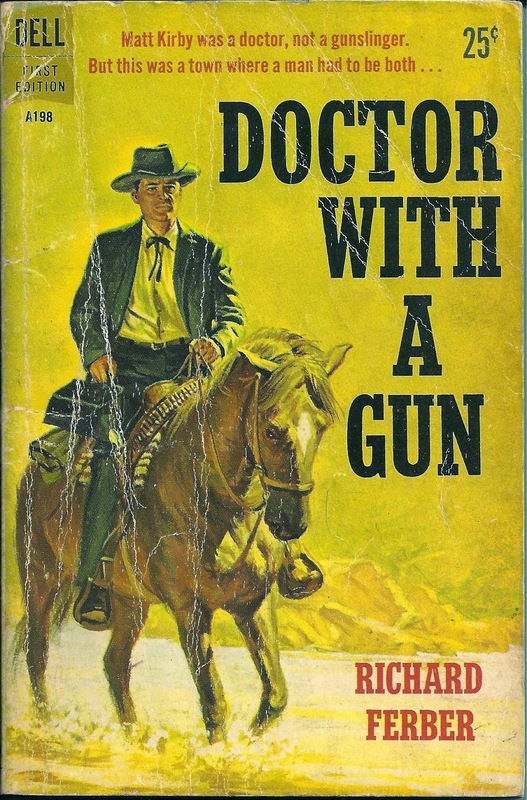 Throughout the rest of the performance, Greene talks about the legendary gunfighter. His words tell the story, in a first-person account, of a Western lawman and his relationship with a notorious gunfighter, Ringo, presumably based on the outlaw Johnny Ringo. It has been pointed out that the song does not fit the known historical facts of the life of Johnny Ringo. However, this did not damage the song's popularity, as it shot to the top of the US Billboard charts on December 5, 1964. It also peaked at #1 on the "Easy Listening" chart, where it remained at the top for six weeks. The single also peaked at number twenty-one on Hot Country Singles chart. In Canada, it hit #1 on the RPM top singles chart on December 7. The song was written by Don Robertson and Hal Blair. Mixed bag today. Some lovely stuff, like the long Downs in the NE and a few other stray longer answers, but then a lot of suboptimal GUNK. Old school crosswordese (SSA SSR SRTA UIES etc) and foreign fragments (PAGO MOLTO etc.) and DESE and DANL just run too thick throughout this thing. Cluing seemed off in a bunch of places too. Floppy disks are PASSÉ? "PASSÉ" is "no longer fashionable," and floppy disks have nothing to do with fashion. People don't use them any more because they have been superseded by better technology, and modern machines simply don't run them. When does a bully say "ANYONE ELSE?"? After he beats one person up and then turns to the crowd of onlookers? This feels like a cartoonish depiction of a 1940s bully. Also, seems like it could easily be said by a victim of bullying who just pummeled the hell out of one of his abusers. Maybe the phrase rang truer, bully-wise, in days OF OLD. A lot of this puzzle felt slightly OF OLD. Bert LAHR! William INGE! "RINGO"! "RINGO" was Not on my radar. I do like that "RINGO" crosses GUNSLINGER, since the word "GUNSLINGERs" appears in the song's first line. JUMBO FRIES is not a thing, so that was terrible. LARGE FRIES, a thing. JUMBO SHRIMP, a thing. JUMBO FRIES, not. Also, a side is only "gut-busting" if the portion is large and you eat all of it. In the art of challenging cluing, there's an occasionally fine line between clever and nonsensical. Consider [It's not drawn due to gravity] for SMILEY FACE. I hated this at first. 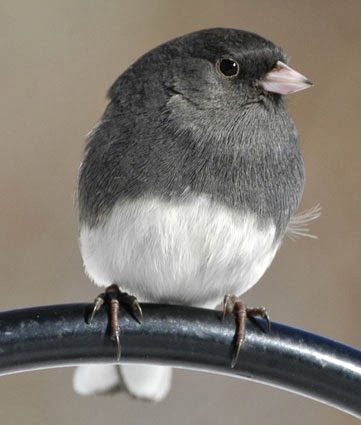 Then I got it—and by "it," I mean "the meaning of 'gravity' in this context." You draw a SMILEY FACE due to levity, not gravity. Gotcha. Hard, but in the end, fitting. Tinea (often called ringworm) is any of a variety of skin mycoses. It is sometimes equated with dermatophytosis, and, while most conditions identified as "tinea" are members of the imperfect fungi that make up the dermatophytes, conditions such as tinea nigra and tinea versicolor are not caused by dermatophytes. This grid is really very good. Long answers in the corner are eye-grabbing, fresh, and engaging, and the short stuff mostly stays the hell out of the way. Clues were suitably tough. Did *not* see "CALVIN AND HOBBES" coming until I (finally, after running the alphabet) got the "V" from BEAV (20A: '50s-'60s sitcom nickname). "Homicidal Psycho Jungle Cat" is the name of a C&H collection. It's especially ironic that I needed so many (well, six) letters to pick this one up, as I just tweeted about Bill Watterson today. 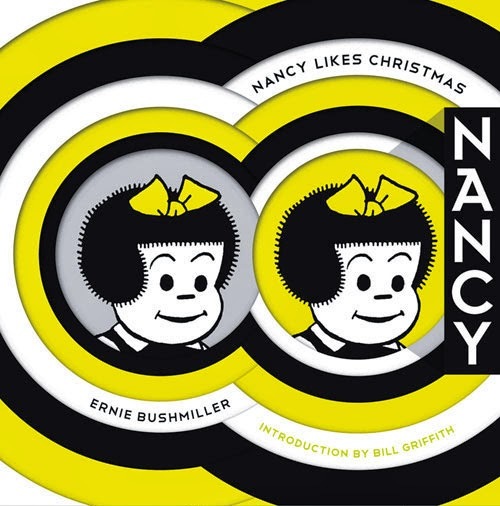 Actually, I was tweeting about the most recent collection of Ernie Bushmiller's "Nancy" comic strips ("Nancy Likes Christmas"—Dailies, 1946-48, Fantagraphics Books), and remarking how I had laughed more in five pages of the "Nancy" book than all post-Watterson comic strips combined. 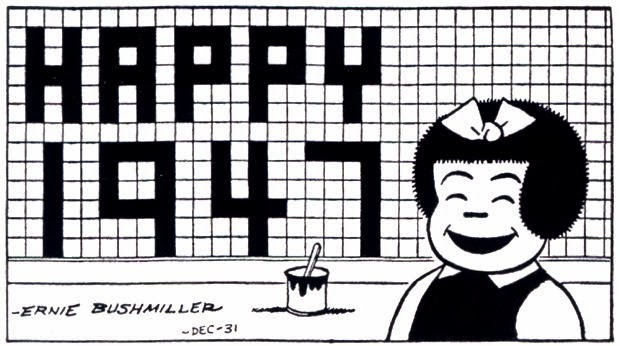 For me, as far as comic strips go, there's Schulz, Watterson, Bushmiller, and then Everyone Else. This puzzle has inspired me to order "Homicidal Jungle Cat" and maybe another volume in Fantagraphics' "Peanuts" series. Tonight. After I write this. Never saw "DJANGO UNCHAINED" (36A: Oscar-nominated film featuring a dentist-turned-bounty hunter), despite its having all the hallmarks of a movie I would see. I don't even know the basic plot, really, so despite the title's familiarity, that one was even harder for me to come up with than CALVIN AND HOBBES. Let's just say the letters string -GOUNCHA- looks, well, wrong. I had SKULK and SNEAK before I had SLINK (23D: Move furtively), which added to my struggles getting out of that NW region. 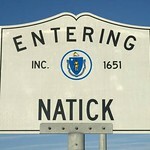 Had TILT for LIST in the NE (a particularly nasty little trap) (21A: Cant). But this one was tough only in the cluing. Besides OBOTE (58A: Leader of Uganda's independence movement), nothing comes across in retrospect as particularly obscure or recherché. DELOS, maybe? (44A: Island where Artemis was born) No, I got that off the "D." OSWEGO? Possibly. I live in NY and there's a SUNY-OSWEGO, so I got that one fairly easily (3D: Port on Lake Ontario). Got AUCKLAND easily as I have been there several times and with the "K" and "D" in place the clue is pretty transparent (40A: Home of Sky Tower, the tallest free-standing structure in the Southern Hemisphere). Also, I'm reading "The Luminaries" and it's set in NZ, although, now that I think of it, I'm not sure AUCKLAND has been mentioned yet at all. Book takes place primarily (if not exclusively—I'm only 10% done) on NZ's South Island (home to hobbits and, in her youth, my wife). ASHKENAZI is really the only way I want to see "NAZI" in my puzzle. Very nice answer on every level (65A: Like Albert Einstein, ethnically). Cute theme with solid answers. 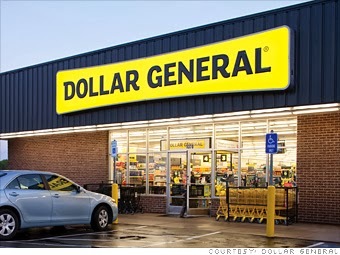 If only the word GENERAL had more interesting letters. The grid is very errrrrrrr-ish. Well, generrrrrrral-ish, esp. if you ignore the obvious Scrabble-f***king in the E and W. Actually, in corners that tiny, you can get away with Scrafu™—none of the results are that dodgy. IERI, on the other hand, redefines "dodgy." Luckily, it's an outlier(i). I finished with a typo that it took me forever to track down because, as I said earlier(i) in the week, I Misspell VARIG (33A: Bygone Brazilian airline). I had VAREG. Again. Perhaps it's because I quite literally have never seen this airline. Today I learn that it's because it's "bygone." Perhaps we can stop using it, then? Please? Anyway, I scanned all the Acrosses and found no typo and then scanned the Downs and noticed two LENs. That can't be, said I. No. It's Maya LIN / LEN Berman (whom I confused with KEN Berman, who is not KEN Berman at all, but rather Chris Berman, it turns out). I had DOPE instead of DRUG (2D: Sedate, say) but later had DOPE where DOPE belonged (42A: Skinny). Never ever "got" DRAT (53D: Alternative to hell?) (i.e. 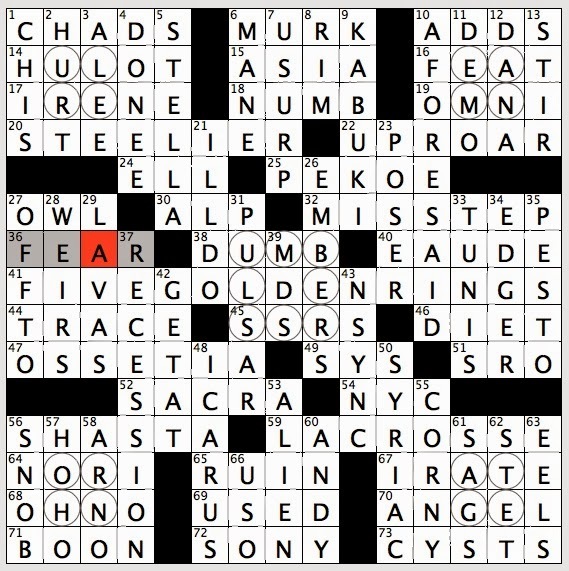 needed every cross—it's not a bad clue AFTER ALL). 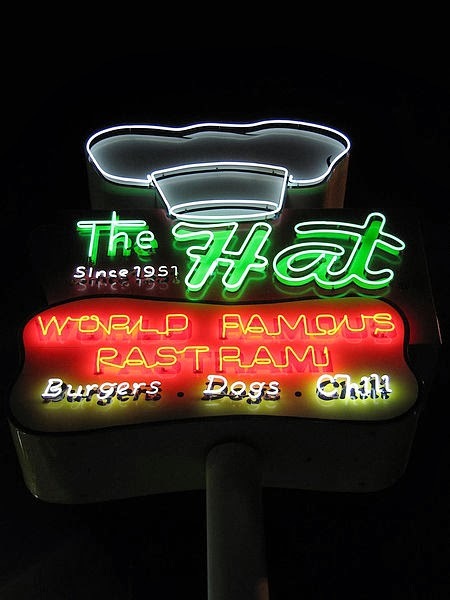 Don't get how "good for" works with SATE (54D: Be plenty good for). "Plenty good" as in "more than enough, quantity-wise"? Stretch. ECARDS, and all E-answers, were among the most hated crossword answers in my Facebook survey of Most Hated Crossword Answers (52A: Animated greetings). Just FYI. 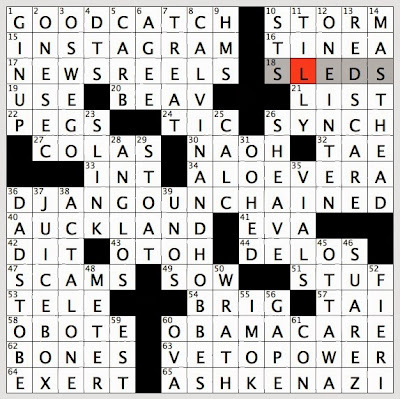 Also FYI: not sure it's the best kind of subliminal advertising to include STALER, TIRED *and* IN A RUT in your grid. Got to get to bed. 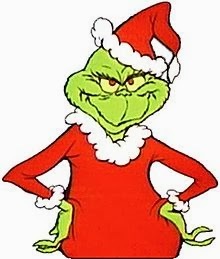 Hope your Christmas was lovely, however you spent it. THEME: FIVE GOLDEN RINGS (41A: One set of gifts in "The 12 Days of Christmas" … as suggested by the circled squares?) — Five "rings" (indicated by circled squares) spell out words that can follow the word "Golden" in common phrases. Fortuitous discovery that FIVE GOLDEN RINGS is a perfect (i.e. grid-spanning) 15. It also works very well as a theme revealer. These aren't really rings, though. They're squares. I'm sure you could draw a circle that technically touched all the letters involved, but rings are rings and squares are squares and these are squares. Still, it's a cute idea, and it's probably close enough for horseshoes and hand grenades, ring-wise. I don't know what a Golden HORN is. Turns out it's the "inlet of the Bosporus dividing the city of Istanbul." Cool. Good to know. The fill on this one is average to below-average, but that's largely due to the theme, which sets up major restrictions all over the grid. I'm not sure that excuses the atrocious EAU DE, but it probably does excuse (or at least explain) the SSRS SYS SYRIAC business, or STET EELS, or DONEE ALEE I'LL DO ELL, etc. Actually, KABUKI (9D: Japanese dance-drama) is quite a nice answer. Always good to be able to shoehorn a winner into such a thematically dense grid. This one played harder than normal for me. Couldn't remember Monsieur HULOT (more used to seeing TATI's name than his character's name in the grid). Had the squirrels eating SUET there for a bit. OSSETIA was slow coming, largely because I know the "rebellious region" as *South* OSSETIA and can't remember ever hearing OSSETIA on its own. Had SYRIAN instead of SYRIAC. You'd think that corner could've been worked out in SYRIAN's favor—would've been a major improvement. No one likes running into an [Ancient Mideast language]. Plural LAVAS is probably something a grid could also do without, though it's mildly interesting that there are, in fact, multiple kinds of lava, and that they have such curious (and, unsurprisingly, Hawaiian) names (29D: Aa and pahoehoe). I don't know why the Times runs puzzles like this—dashed-off trivia-crammed puzzles about the recently deceased. This doesn't come off as tribute. Comes off as a rush job. Bunch of data crammed in a grid. 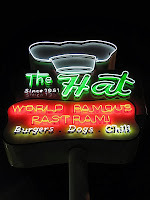 Fake theme answers like TATA (46A: Father, in Xhosa, and a nickname for 36-Across) and ATTENDEE (3D: Barack or Michelle Obama, at the memorial service for 36-Across) only add to the haphazard, arbitrary, whatever-fits feel of the "theme." A well-crafted puzzle with a clever hook of some kind would've been worthy of the man. This just feels weirdly slapdash. Certainly NELSON MANDELA's life is worth commemorating. I just don't quite see this as rising to the level of "commemoration." Also, "role" is a very, very weird word to describe PRESIDENT OF / SOUTH AFRICA. Broadly defined, sure, I guess "role" works, but I was like, "Mandela was an actor???" This puzzle was much harder than your typical Tuesday, but I think it's an asterisk puzzle—not made in accordance with normal Tuesday standards. Singular. An outlier. A obituarial one-off. PONY CAR!? Yeesh. That, crossing DYE, nearly derailed me. Never heard of a PONY CAR. 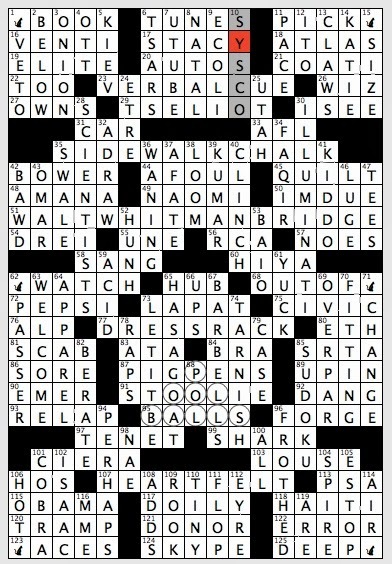 I LOL'd at TWO-D (27D: Having no depth, briefly), which came up in a recent Rex Parker Facebook discussion as one of my reader's Most Hated Crossword "Words." I suggested we start saying it as one word, TWOD, pronounced just like it looks. We could use it as a pejorative for someone we don't like. "Don't be such a TWOD, Steve." It's good because it sounds profane but is merely nonsensical. Now if you'll excuse me, I have to go REPACK for my trip to the Philippines, where I am planning to REMAP ILO ILO (actually, I just have a really early appointment and so need to get some sleep). It's a Monday puzzle. It is pretty average in that regard. First-words-have-X-in-common. Pretty standard fare. Valiant attempt at interestingness with the, let's say, revealer, but it doesn't really make sense. I "take" the RIVER to the "bank"? Like, the word? I take the word "RIVER" and put it next to the word "bank"? Yeah, that makes no sense. I see that the revealer is a "?" 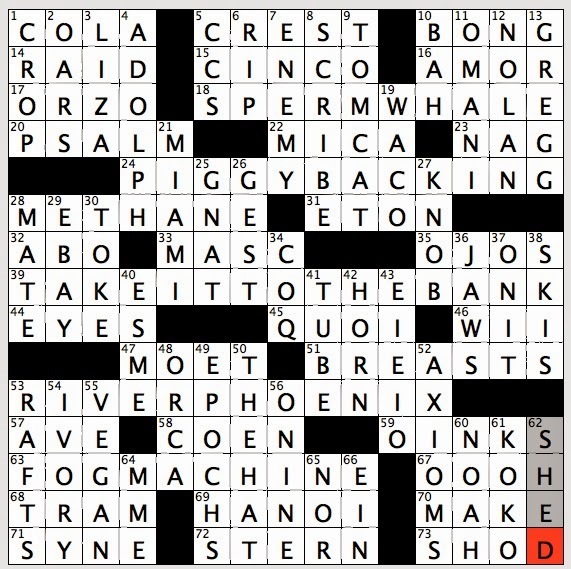 clue, which does give you some leeway, but … still. Doesn't work. Also, this pangram stuff is strictly amateur hour. I saw that "Q" at COQ/QUOI (!?) and I was like "Whoa! That is some serious Scrabble-f***ing. Why would you do that?" Then I finished, and sure enough—all 26 letters. Ugh. Surprised anyone still thinks this is a feat. Three extra foreign words just to get your precious "J" and "Q" (and "U", actually)?—patently not worth it. Of course who really cares on a Monday when it's easy? (This must be the rationale—people will tolerate sub-optimal fill 'cause they've seen it so many times and it didn't create added difficulty so why not?). But, again, for the millionth time, puzzles should be filled with quality, smoothness, and sparkle being the highest ideals. The pangram ideal is … not one. O'NINE? Come on. It's a Monday. The theme is not taxing. Fill the grid with real stuff. OOOH? Jeez louise. EIEI-no. P.S. where's BLOOD? 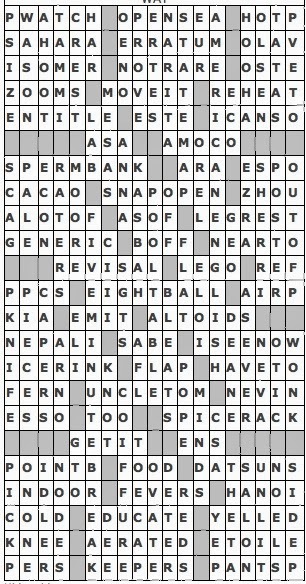 Not good to have one of these types of puzzles and have such an obvious candidate missing. It's not like there are infinite candidates. BLOOD is more common than FOG where "banks" are concerned. BLOOD is a weird omission, in that it's the one "bank" you'd *expect* to see. One of the first that is going to come to mind when confronted with "___ bank." Also SNOW. Also, re: FOG, at least RIVER, PIGGY, and SPERM had their contexts changed in the theme answers. Something like "FOG OF WAR" might've worked here (i.e. not a literal "fog"), but FOG MACHINE doesn't offer sufficient recontextualization. THEME: "Good One!" — Clue to all theme answers is [See blurb]. 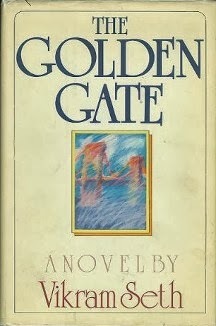 Blurb reads: "When this puzzle is done, draw a line connecting the 21 circled letters from A to U in alphabetical order. The resulting shape will provide a clue to 6-, 8-, 14-, 53- and 70-Down." 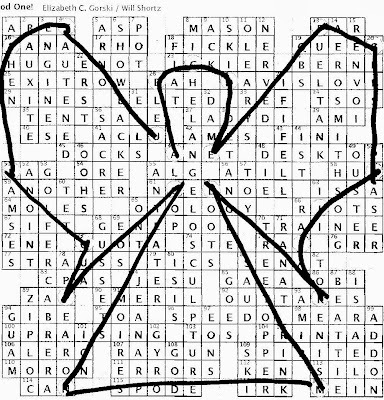 So it turns out the clue for all theme answers is ANGEL, which is the picture you get when you do all that connect-the-dotting. Should've been harder than it was. Once I had most of SHOW BACKER filled in, I knew what the theme was. Done and done. Only theme problem I had was remembering what sport Angel CABRERA played (I had baseball, but no: golf). If I hadn't hit SHOW BACKER first, it might've taken me Much Longer to figure out the theme. But as it was—fastest recorded Sunday time since early September. I'm not the biggest fan of post-solve drawing—in this case, it was Highly anti-climactic—but I like the thought here. It's seasonal, and cleverly executed, and the fill doesn't suffer terribly under the burden of a reasonably demanding theme. So thumbs up. I was surprised to see my time be so low, as I felt like there were a number of times I came to a dead stop or at least floundered a bit. 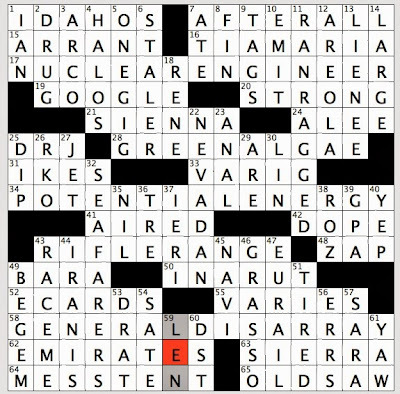 I had some trouble getting into the NE, as I had the bottom but not the top of the theme answer, and then needed to look at all the clues up there before finally getting QUEEG (total lifesaver, as I never would've gotten QBS or GEES or FAR or (especially) RENVOI without that QUEEG kickstart). 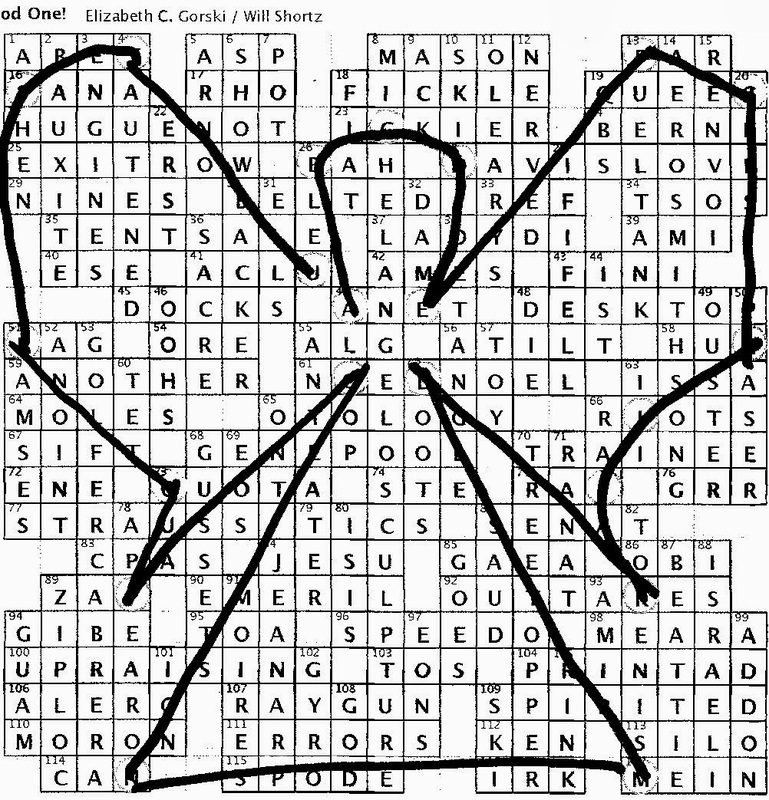 I love NOEL, NOEL crossing the heart of this grid. Bonus theme answer! "IF I FELL" is another fine-looking answer. Also love HUGUENOT, as it reminds me of my favorite Christmas film, "The Ref." The main family is the Chausseurs, and they repeatedly correct people's pronunciation of the name and then tell them "it's 18th-century French HUGUENOT." Here's the opening marriage counseling scene with Judy Davis and Kevin Spacey (warning: profanity). Is it weird or bad or apt or what that "ANGEL" is embedded inside MICHELANGELO? Seems intended, so … apt? A few other puzzles to point you to today—for your holiday enjoyment. The first is risqué, so if you are easily offended, please don't bother. However, if you enjoyed last week's Sunday puzzle, and can handle a little … playful bawdiness, I think you'll get a kick out of this one: "Box Set" (constructed by Anonymous, aka "A Cunning Linguist") (PDF / .PUZ). The second puzzle is "Seasonal Staff" by Francis Heaney, this week's American Values Club Crossword puzzle. Get it here for a dollar (though you really should be a yearly subscriber by now). I swear you won't be disappointed. It is hard as all get out, but if you make it to the end, the reveal is spectacular (Note: I'd print it out and solve it on paper, if I were you). Lastly, if you are a fan of Ms. Gorski (today's puzzle constructor) and you are jonesing for more high-quality, relatively easy puzzles to do, consider her weekly puzzle from Crossword Nation. Yearly subscriptions are cheap. They'd make nice last-minute Christmas gifts for pro and novice solvers alike. Information here. 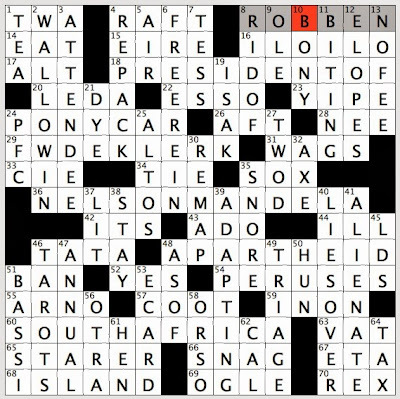 The great thing about the independent puzzle sites I've been recommending is that a. the puzzles are of a very high quality (higher, often, than that of the NYT puzzles), and b. the constructors either own their own product or receive more equitable pay than any newspaper or mainstream puzzle publication currently offers. The NYT pays $200/Mon-Sat and $1000/Sunday, which is an embarrassingly, ridiculously low fee for the self-proclaimed "gold standard" puzzle to be paying its constructors, esp. since the NYT takes in better than $2 million / year *in online puzzle subscriptions alone*, to say nothing of how valuable the puzzle is to the NYT's dead-tree circulation—do you have any idea what would happen to dead-tree subscriptions if the crossword suddenly disappeared? If you think "not much," then after I stop laughing I'll tell you that that's what you're supposed to think. You're supposed to think "not much." You're supposed to think of the crossword as a cute little diversion, tucked away over there in the Arts section. You're supposed to see it as a quaint, ancillary thing. Nothing to do with news. Just a game. A lark. Don't ask questions about money—that's just … not done. Rude, really. Déclassé. 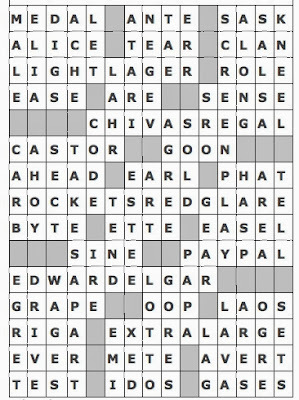 But the NYT knows that the New York Times Crossword Puzzle is a cash cow. How big of one? I don't know. I'd love to know. 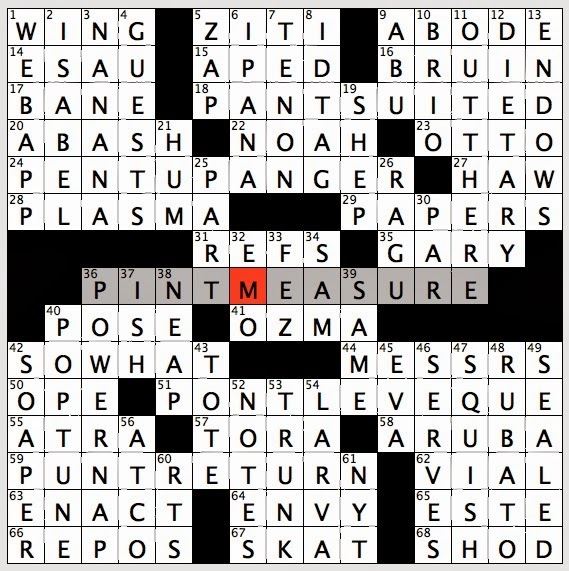 Can someone answer this question accurately: How Much Is The Crossword Puzzle Worth, In Dollars and Cents, to the NYT? It's an important question to ask—I don't think you can begin to determine what "fair" pay is until you've answered it. Because labor costs involved in producing crosswords are (at this point) very small, and because crosswords are a kind of ritual practice (i.e. 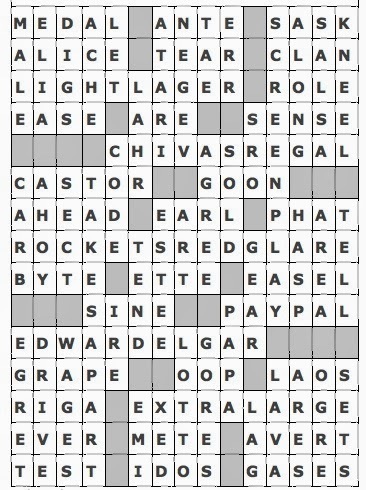 they keep tens of thousands of people attached to their papers on a daily basis), the crossword is probably one of the few reliably profitable things about the paper. I stopped submitting puzzles to the NYT in large part because they don't pay constructors anything close to what their product is worth. Many good constructors I know don't submit to the NYT much if at all any more, for this reason as well as other, non-financial reasons (about which … some other time). I don't know why the absurd financial realities of crosswords aren't better known. The pay system is insanely out of whack. But it's What The Market Will Bear (a common defense from apologists) and Pay Has Actually Gone Up Under the Current Editor (another common defense from apologists). So… whaddya gonna do? 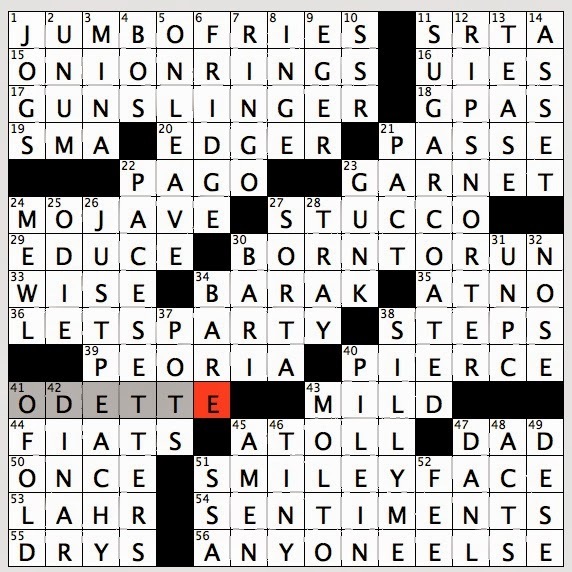 The NYT crossword puzzles, while no longer the freshest or most cutting-edge, are still decent—occasionally brilliant—and maybe both overall puzzle quality and constructor compensation will improve in the future. In the meantime, independent puzzles are thriving. Their generally high quality and increasing popularity are eventually going to force the NYT to up its game (and—if there is any justice in the world, which of course there isn't—its pay). I'm told the editor is going to be seeking a constructor pay raise soon. Very curious to see how that goes. P.S. Patrick Merrell has a free 15x15 puzzle for you — "Up, Up and (when I catch my breath) Away!" 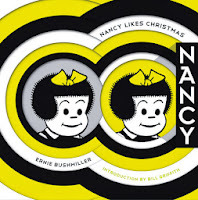 ("If you like it, consider it a Christmas or belated Hanukkah gift, even though the theme has nothing to do with either holiday. If you don’t like it, demand a refund!"). Get it here.